Howard A. "Rudy" York, Colonel, born July 15, 1918, Yacolt, WA, graduated from the University of Washington in 1939. After two years of law school at the University of Washington he was awarded the ROTC honor graduate commission in the regular Marine Corps. He was assigned duty aboard the USS West Virginia in October 1941. He left the ship on the 0745 liberty boat to participate in a Honolulu Police Pistol match, but returned to the ship about 0840. He abandoned ship at 1030 in the last motor launch, which with its 126 occupants and had about six inches freeboard. During his career in the USMC he commanded two fighter squadrons, two fighter groups and two air stations. For action in WWII and Korea he was awarded the Distinguished Flying Cross w/ Gold Star, Legion of Merit w/Combat V, Bronze Star w/Combat V and Palm, Air Medal w/2 Gold Stars, plus 10 theater and citation ribbons. 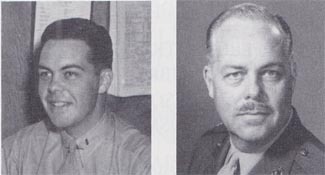 COL York retired June 30, 1966.